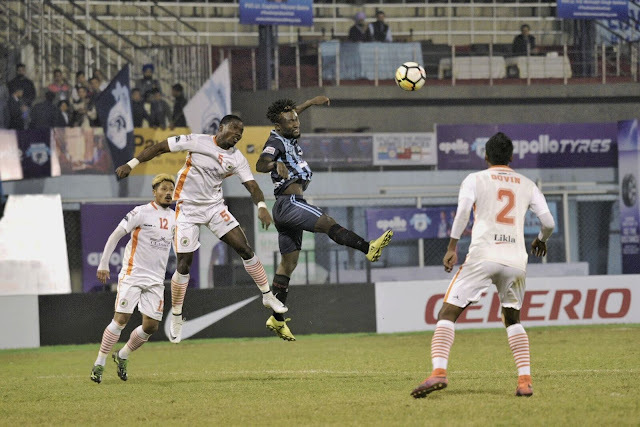 In the battle of wits, Minerva Punjab overcame the debutants NEROCA FC by a margin of 2-1 in a mouth-watering Hero I-League fixture tonight in Ludhiana. After Felix Chidi (18′) put Neroca FC in the driver’s seat, Chencho (24′) quickly restored the parity before Lago (45′ +2′) tapped it home to secure all three points for the hosts. NEROCA started the match with high pace and intensity which bothered Minerva’s defence for much of the starting 20 minutes. Arshdeep had to pull up his socks in the 3rd minute itself when he dived to his left to save a brilliantly taken curling shot. Chencho had a good chance in the 16th minute when his powerful shot was made life difficult for NEROCA captain and Goalkeeper Lalit Thapa. Meanwhile, Minerva’s back four stood firm until the 18th minute when a superb solo run by Odili Chidi resulted in the first goal of the match. NEROCA didn’t get much time to celebrate as Minerva Punjab struck back 6 minutes later in the 24th minute through Chencho who beat his marker on the left corner of the penalty box and then hit the ball in the far right corner of the goal. Minutes later, NEROCA won free kick just yards outside the penalty area but the resultant kick by Akhlidin went over the crossbar. Minerva Punjab would have taken the lead in 39th minute itself when Chencho went one on one with the keeper but he simply could hit the target. Just as the first half was about to end, Lago Bei found the net from Abhishek’s cross. Lago took a touch and then slotted the ball into the left corner from 4 yards out. This vital goal just before half-time changed everything. The second half was more about Minerva sitting back to allow NEROCA to attack and hitting them on the counter-attack. NEROCA made two quick substitutions early on in 2nd half to find a way to penetrate Minerva’s defence. Chencho got another opportunity later on in 76th minute when he dribbled past two defenders to go one on one with the keeper but his shot brushed off the right goalpost. Lago created an opportunity for Minerva in the 88th minute when he almost scored from 30 yards. NEROCA could find any more good opportunities and home side Minerva Punjab emerged victorious. With this victory, Minerva Punjab goes atop the league table with 4 points from 2 matches.